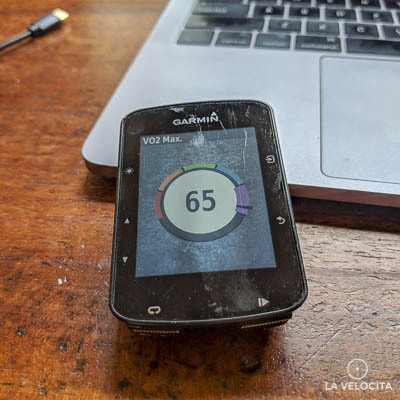 Garmin Edge 520 Plus review - LA VELOCITA. Early/mid 2018 saw the surprise announcement that Garmin would be releasing an updated version of their 520 rather than the anticipated Edge 530. We got our hands on a review unit from Garmin and gave it a workout. Does it still compete in a market with plentiful, and cheaper alternatives? The 520 Plus is ostensibly the same as the 520, but with an all black case. There’s the same button layout with three on the left, two on the bottom and to on the right, with each programmed with single functions except start/stop. I’ve spent the last few weeks using Lezyne units and their 4-button layout can be confusing. It’s nice to have so many buttons with no confusion about what they do. The charge port is on the back, beneath the quarter turn mount. Placement of the charge port makes on-bike charging with a USB basically impossible which is a small bummer for those doing very long rides who might want to charge the unit in the mount. Garmin makes no claims of changing screen from the 520 to 520 Plus but noted some subtle differences on close inspection. The 520 Plus doesn’t look quite as sharp and is slightly more dull than the 520 with and without the backlight. It’s subtle but noticeable when you have them side-by-side. The buttons are slightly different too, with a lighter press needed for the 520 Plus. 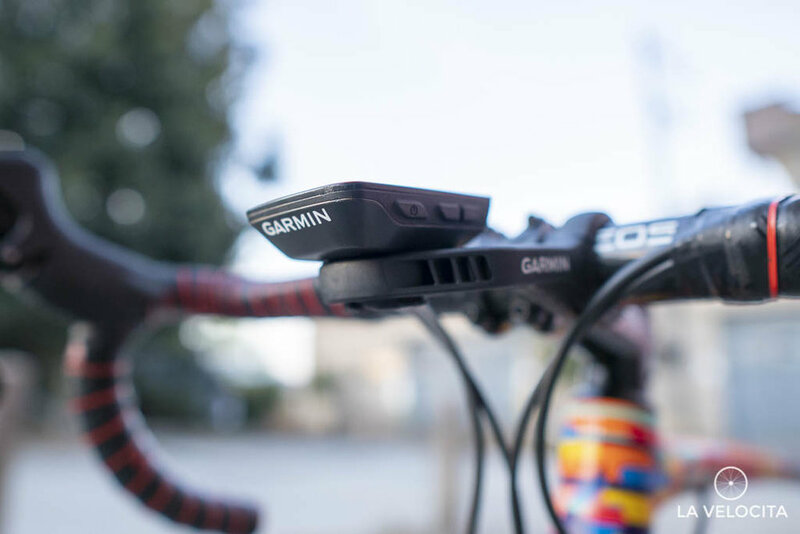 Garmin sets the standard for GPS hardware. No other brand comes close to the svelte lines, compact size, and the flat unit face. I’ve always liked Garmin hardware and the 520 Plus is still a good lookin’ unit despite being a few years old. The buttons are responsive and have a nice click without too much pressure being needed. 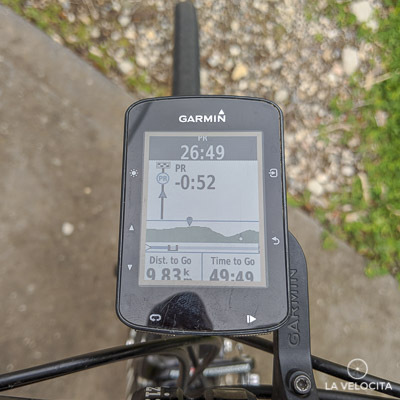 I’ve never been a fan of touch screen bike GPS units - hence my switch from the 800 to the 520 years ago - and the 520 Plus is still a cinch to control. Just a note that this review unit has apparently lived a hard life and is pretty banged up. They don’t come new like that! Turning on the 520 Plus, I tethered it to my phone and fired up the Garmin Connect app. Once paired, I entered a few physique details and confirmed the heart rate and power zones generated from the years of data in my Garmin account. Setup moves to the unit after that and you will take a deep dive into Garmin’s menu structures. Setting up the 520 Plus is a very familiar process to me because of my years owning a 520. Activity Profiles store a lot of settings including; data pages/screens, type of riding, Strava Live segments on or off, GPS mode, Navigation, Alerts, and Auto Features. There’s a separate Settings menu that changes Display, Data Recording, Units, Tones, Incident Detection, and Tones. The menu structures are deep and often confusing. Changing a single data field is a voyage through the menu: Menu>Settings>Activity Profiles>Profile>Data Screens>Screen Selection>Field Selection>Data Category>Data Field. A welcome change to the 520 Plus are multiple layouts for data fields. So a 4-field screen can have equal horizontal spacing, or you can have 2 smaller fields and the top and 2 larger fields beneath. It’s a small touch, but I appreciate being able to preference certain data to increase visibility. There’s a staggering variety of data the 520 Plus can harvest and display. Everything from average speed to pedal smoothness and even vertical speed. There’s far too many things to list, so suffice to say I’d be surprised if your data needs aren’t fully serviced by the 520 Plus. Unfortunately, setting up and changing settings on a 520 is a time consuming and tedious process. I’ve done it many times over the years and the 520 Plus is no better than its forebear. I know Garmin is capable of better because the Edge 1030 and 820 have a vastly improved interface over the 520. The user interface (UI) hasn’t materially changed from the 520 to the 520 Plus. Its setup process is far inferior to units from Wahoo and Lezyne that have smartphone app integration, and even the Edge 1030 that was released roughly a year earlier. The 520 Plus connected easily to a pile of Garmin hardware. My speed, cadence, heart rate, and Varia UT800 light were all tethered and communicating in no time. It quickly and easily pairs to my phone too. During use, none of them dropped out or showed any issues. I didn’t use the sensors in the box because I already had identical versions that I’ve been using for years now. The heart rate monitor is excellent, the cadence sensor is discrete, and the one-piece speed sensor is relatively unobstrusive. The bundle represents very good value at $499 compared to $449 for the head unit alone. Annoyingly, the 520 Plus would not detect my Stages Power Meter at all during the time I had it. I couldn’t detect it when looking for power meters, or just doing a mass scan of all nearby sensors. The Stages successfully connects to every other GPS I’ve tested, and my phone so something is amiss with this particular unit. Garmins have a distinct ride experience that sets them apart from other units. The 520 Plus is lightning quick to start-up, connect to sensors and phone, and find satellites. The race from unit start to data recording will be thoroughly won by the Garmin 520 Plus over all the other units I have tested. When riding, there’s a swag of useful screens that you can turn on or off, including; Elevation, Lap Summary, Compass, Virtual Partner, Cycling Dynamics, and Light Network (for Garmin lights). You can even get real-time weather data when tethered to your phone. I cannot fault Garmin for their suite of options available when you’re riding. They give you everything and let you pick and choose what you want. You can receive call, text, and other notifications to the head unit when your phone is tethered. It works just fine but I did have to turn off Facebook Messenger notifications on my phone because they bombarded the 520 Plus on the first couple of rides. I’ve been switching between the touch screen 1030 and the button-operated 520 Plus over recent rides and I still prefer buttons. Garmin have placed the arrows to scroll menus or change screens within index finger reach when you’re riding on the tops. The screen itself is still fine, and looks no different to the 520. It doesn’t stand out as particularly good or bad. Battery life appears to have improved over the 520. Garmin claim a 15 hour battery life but I’m maintaining my established stance that testing for maximum battery life is pointless because that efficiency means sacrificing features that most people use. Instead I ran a side-by-side test against my own Edge 520 where both units recorded the same 46.5 km, 1:52 ride with the same settings. The 520 Plus impressively still had 93% battery at the end compared to 77% on my 520. I did battery tests when following a 73 km course with full turn-by-turn navigation in an 82 km that included a lengthy 90 minute stop while I ate all my Nanna’s food. There was an impressive 63% battery remaining. The mapping capabilities usually blitz older Garmin batteries so it appears some clever optimisations have been done. The 520 Plus is a pleasant unit to ride with, once you’ve turned off the incessant bleeps. The screen is nice enough quality and the hardware discretely packs surprisingly good battery life. Mapping and navigation is the main selling point of the 520 Plus over the 520. The unit comes with Garmin’s Cycle Maps that are stuffed with details. It’ll tell the basics like what street you’re on and what street you’re approaching. Then it goes above and beyond, showing you bus stops with a little icon, parks, and even has a particular green texture for vineyards. Vineyards! Once those novelties wear off, you can have full turn-by-turn directions and navigation queues too. Following courses will display as big and obvious line on the map screen. You can tweak the screen with automatic or manual zoom, and even two data fields of your choice. There’s a suite of guidance options with the 520 Plus. You get full turn-by-turn directions, warnings for going off course, option to activate and deactivate Strava segments, and the ability to choose between Garmin and Strava Routes, more on this below. Good news for 520 owners is that you can add the Strava Routes app to your device through ConnectIQ. Navigation queues are plentiful when you’re following a route. The mapping screen itself shows a thick purple line to indicate the route, and you’re warned well in advance of turns. You can choose between navigation prompts to switch automatically to the map screen, or just show you text over data screens. You can tweak the route creation options inside the unit too, telling it to favour certain terrain according to what bike you’re riding. So you can ask for gravel, smooth tarmac, mixed terrain, or trails only when you ask the unit to take you somewhere. There’s also avoidance options to keep you away from highways, toll roads, ferries, and a few other things. You can save locations to the 520 Plus and ask the unit to guide you to it on demand. It can guide you home, to work, or to your favourite cafe. I can see this being a useful feature if you’re travelling and want to save your ride start point. The weakness for the 520 Plus’s map system is only getting the region it was purchased in. I have awesome maps for Australia and NZ, but I get nothing if I go abroad. Lezyne’s system that lets you drag boxes over anywhere in the world and exporting the map files to a Mega GPS unit will cover you wherever you want to go just with less detail, and Wahoo’s ELEMNT Bolt ships with much of the world’s maps included. Garmin still sets the standard for maps and navigation for bike GPS units. It is a bummer that the maps are region-locked though. That could limit desirability for the globetrotting cyclists who need maps everywhere they go. There’s some basic training options stored in the 520 Plus. You can program basic interval training with set time/distance with rest and repeat options. Intensity is up to you, with no option to add target power to the interval settings. There’s an option to run Workouts created in Garmin Connect. There’s a fairly flexible interface where you can structure a workout with target zones, or specific time/speed/power for certain durations. Extra steps and repeats can be added to make quite a detailed workout. Once saved, it’ll export to your device and it’ll run through the workout. It’s an ok system, but doesn’t have the depth and flexibility of services like TrainingPeaks or Today’s Plan. Speaking of TrainingPeaks, there’s a pre-loaded app for that platform accessible through the ConnectIQ menu. So all you TrainingPeaks masochists can run your scheduled workouts on the 520 Plus. I can’t comment on how it works because TrainingPeaks is a paid service and I don’t want to pay ¯\_(ツ)_/¯. Other options include indoor trainer mode, distance/distance and time/distance and speed targeting and an option to choose a recent activity to follow as an activity. Garmin’s integration of Strava Live segments was a huge selling point for the original 520 and they’ve given it a slight refresh on the 520 Plus to make it even better. The unit gives you a notification and a countdown to upcoming segments. There’s now two screens for the segment once you start. One that shows the map with distance countdown and progress against the target time, and the other shows an elevation map and progress against your target in the middle, target time at the top, with distance and time countdown at the bottom. You can also switch between segments if you’re on multiple at the same time, and change whether you’re targeting a PR, KOM, or next Strava follower ahead of you after you’ve triggered the segment. My one gripe is that the Segment page clears too quickly after you’ve finished it. Riding to power means I spend most of the target segment watching power data, especially in the crucial last stages of the effort. Multiple times I’d gasped, drooled, and gurned my way through a horrendous effort and tried to switch across to the segment screen for my result only to see it’s already gone and I have to wait until I’m home. A small gripe but one that I’d like to see changed. As mentioned above, navigate through the Connect IQ menu and you’ll find the Strava Routes app that will can connect to the routes you’ve created. Select Strava Routes when your phone is connected and you’ll be asked for permission by your Garmin Connect app to access your Strava account. You’ll then have access to all of your Strava routes on your Edge while the phone is connected. It’s a very welcome addition because Strava’s route creation has become one of the best out there, and my personal favourite. The Strava Route was a bit wonky under my test conditions though. After processing a route it created a course to the start of it, despite me telling it not to. It then drew a 13 km course to get me to the route start that was 500 metres away before failing to notice I’d rolled past the beginning and bleeped at me to turn around for a couple of minutes. Once it recognised the route, it all calmed down and was very good. It gave full turn directions for the entire course and quickly re-calculated if I took detours. 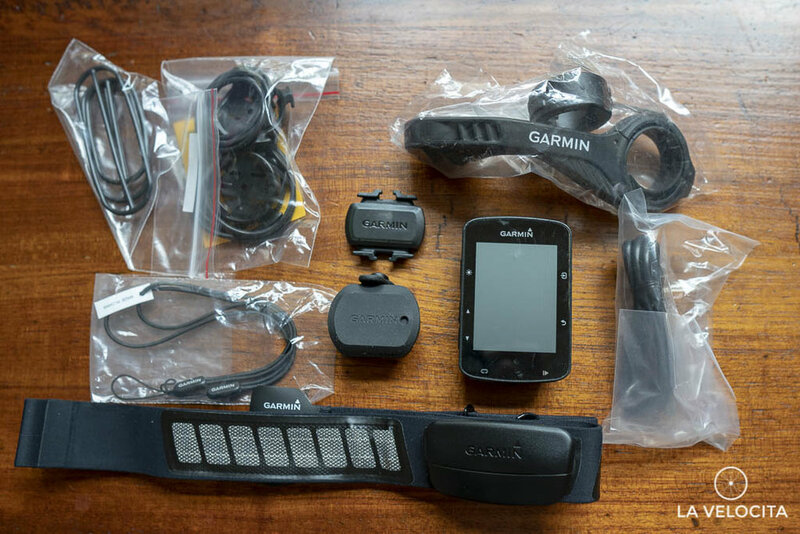 Garmin reviewing is the same as Garmin ownership; there’s a bunch of stuff you’ll never use. So here’s a couple of features that I’ll acknowledge and then explain why I didn’t use them to make a point. The first is a feature called GroupTrack that will show connected people’s location on your map. It’s intended to help groups track each other’s location in case you all spread out along a course, or anyone gets lost or has to stop for some reason. It’s got potential to be a useful feature. The second is direct messaging from compatible Garmin units that have been connected together so riders can send short template messages to each other. I couldn’t test it for two reasons; compatible units (Edge 520, 820, and 1030) are very scarce among my ride buddies, and there’s little reason to connect everyone together when we all have phones that are better at communicating when we need to (when stopped of course!). It’s an issue that encapsulates the modern Garmin ecosystem; new Edge units always have some nice new features rarely enough to warrant turfing an older and still functioning Garmin, and people have started to seek alternatives from competing brands. Garmin’s bluetooth uploading is so fast that an activity saved at my front gate will have uploaded before I reach my front door 5 metres away. Nothing else comes close. The ride gets uploaded to Garmin Connect and shared across Strava and other connected accounts. There’s also a suite of post-ride analysis flashed across the unit’s face including a recommended recovery time and any personal records you may have set on the ride. Personal records are device-specific, so it seems that Garmin Connect doesn’t communicate to new units I’ve registered to let it know what my previous records are. It’ll track and notify you of new FTP and VO2 Max values during your activity and flash them up onto your screen after you end the activity. It’s something that feels well under-utilised because it’s there and gone. I can’t find any record or tracking of these metrics in Garmin Connect. It seems like a missed opportunity that the data is getting generated but is stored on the device where you won’t see it until you improve on it. You can do some post-ride analysis through Garmin Connect. It’s free, and has a lot of the basics but there’s so many services that do more, better, or both. It appears that Garmin knows its strengths lie in hardware and don’t sink too much capital into software like Garmin Connect. The Edge 520 Plus enters a very different GPS market to the 520 that came out in mid-2015. Wahoo’s ELMNT Bolt ($399) and Lezyne’s Mega C and Mega XL ($300) don’t beat the 520 Plus for quantity of features, or quality of maps, but are better in other ways. They have full smart phone control, much easier UI, and either ship with most global maps in the case of the ELEMNT Bolt, or can have them added in for free like the Lezynes. So who’s the 520 Plus for? It’s for someone who really likes the Garmin ecosystem, and wants a small unit with great maps. Its $450 AUD price is quite good considering the features and capabilities of the unit. It’s still lagging behind in expected 2018 features though. An updated UI and phone integration would make this a phenomenal unit. The Edge 520 Plus has tons of great features packed into its familiar casing, along with a whole bunch of other things you’ll likely never use and maybe not even be aware of. The hardware, maps, and data options set the standard for cycling GPS units. The speedy startup, satellite connectivity, and ride uploads make for a slick unit to use. Garmin still sets the standard for features. There’s a huge amount of tech stuffed into this unit and, again, $449 for the head unit is a good price for all of it assuming you’ll use enough of them. The $499 bundle is even better value because the sensors are worth far more than $50 if you buy them all separately. A lot of my problems with the 520 Plus stem from it feeling half-baked. It’s kept all that’s good about the 520, added some more good things, but retained all of the bad. The clunky interface, deep menu pits and lack of smart phone integration were more tolerable in 2015 but not in 2018. I tested the 520 Plus and Edge 1030 at the same time so I’ve seen what Garmin are capable of. The Edge 1030 feels like a modern unit. The 520 Plus doesn’t, despite being the newer release. I have to wonder why they didn’t make a 530 with the vastly improved interface from the 820 and 1030. If you want a small GPS with market-leading maps for your region then you should absolutely consider the 520 Plus. Same if you’re heavily invested in the Garmin ecosystem with mounts and other hardware from their catalogue. Disclosure statement: The 520 Plus was a review unit sent by Garmin that will be returned.